Our music editing department is creative and talented. Experience gives us the skill to translate your vision into your dream wedding memory. Developing this memory is a process we have perfected. Music editing and mixing for your wedding can be as varied and unique as your ideas! Everyone hears the voice of the groom with a message to his bride as they begin to dance. Later in the song the bride's voice comes in and her personal message takes the spotlight. This popular addition can be orchestrated with many variations. Here is the message left by Dean (The Groom from the audio clip) on the Monday morning following his wedding. You may prefer this to be a surprise with one person knowing nothing about it. This could be done by contacting our office and making the arrangements to record your personal message. Although this takes some planning and organization, the results are worth the effort. Sometimes, both the bride and groom want to take part in this personal touch. Both come in and record their message - but each message is recorded in private. They both know a message is coming, but neither person has heard it before. With excited anticipation the messages are unveiled during the first dance. Groom to the Bride during the first dance. Bride to the Groom during the first dance. Father to his Daughter during a Father/Daughter Dance. Groom to his Mother during a Mother/Son Dance. Mother to her Son during a Mother/Son Dance. Parents of the Bride & Groom to the Bride and Groom during the first dance. Bride & Groom to their parents during the first dance. Use your imagination - if you have an original idea let us know. We will make it work for you! To make this a unique and memorable moment you will cherish the rest of your life - You need a professional. Sounds Unlimited Inc. continually produces new and creative ways to have the messages of brides and grooms delivered on their special day. 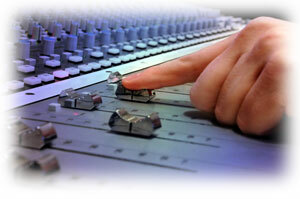 All of the recording, editing and mixing is done in advance leaving nothing to chance at the reception. To hear more samples of what other couples chose, and to begin planning your personal message - please contact us for an appointment. Are you wondering which song might be the perfect song to use as your first dance? We will mix two or more or your favorite songs together. Your memories will come to life as you dance your own "custom first dance". Would you like to surprise your guests with an energetic alternative to the traditional first dance? Anything is possible. A popular variation includes starting with a slow song cutting into an upbeat energetic song then finishing with the original song. Use your imagination and let us work with you, creating a unique and memorable dance moment.